BOSTON — The Coast Guard coordinated a good Samaritan crews rescue of a sailor approximately 700 miles east of Cape Cod, Mass., at approximately 5 a.m. Tuesday. Watchstanders from the 1st Coast Guard District command center in Boston were notified at approximately 8 a.m. Monday of a commercial emergency beacon signal registered to the 34-foot Canadian flagged sailing vessel Easy Go. A Coast Guard Air Station Elizabeth City, Md., HC-130 Hercules aircraft crew immediately launched to locate the Easy Go. The district command center watchstanders also contacted available vessels in the area to assist. Crews from the 652-foot motor vessel Bishu Highway and the 751-foot long motor vessel Athina L were able to assist. The Bishu Highway arrived on scene at approximately 2:45 p.m. Monday, and established communications with the Easy Go. The only sailor on board reported that he was uninjured, but the boat had lost its main sail and he was unable to make way. The Bishu Highway was unable to rescue the sailor due to a 50-foot height of the hull above water, but was able to stay on scene until the Athina L could assist. The motor vessel Athina L responded to a Coast Guard Automated Mutual-Assistance Vessel Rescue System request and rescued the sole person onboard the disabled sailing vessel Easy Go on November 3, 2013. 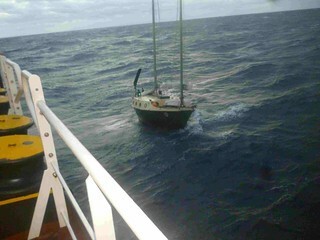 The Athina L arrived on scene at approximately 5 a.m. Tuesday, and safely rescued the sailor. There were no injuries reported, and the sailor will continue to the Athina L’s next port of call of Hunterston, U.K. The Athina L is a participant in the Automated Mutual-Assistance Vessel Rescue System, which is sponsored by the U.S. Coast Guard and is a unique, computer-based, and voluntary global ship reporting system used worldwide by search and rescue authorities to arrange for assistance to persons in distress at sea. With AMVER, rescue coordinators can identify participating ships in the area of distress and divert the best-suited ship or ships to respond. AMVER vessels send periodic position reports to the AMVER center until arriving at their port of call. This data is able to project the position of each ship at any point during its voyage. In an emergency, any rescue coordination center can request this data to determine the relative position of AMVER ships near the distress location. On any day there are more than 5,000 ships available to carry out search and rescue services. AMVER vessels also allow a greater reach for search-and-rescue missions further out to sea and it saves resources, time and money of the Coast Guard when they assist. Weather on scene was 15-to-20-foot seas with 40-knot winds. The Athena L is a Liberian-flagged bulk carrier and has been enrolled in AMVER since Oct. 14, 2011. The sailor is my Brother-in-law and I wish to express my greastest thanks for the efficiency and coordinate effort in saving his life. So glad Bob is okay and wonder what happened to the boat. Thank you AMVER players!